You can help out. If you see a question or answer that doesn't meet our community standards, use a (polite!) comment to ask the author to fix it, or be bold and edit it yourself, or flag it to bring it to the attention of the sleeping busy moderators. What constitutes a good, polite, guiding comment? After reading Chris F's post urging the community to step up and help with community moderation, his question, and the inspirational response by Jerry Coffin, got me thinking about how and where to begin. While it may seem like common sense, I believe that all of us could use a refresher or some ideas on how exactly to leave this type of comment. Communicating over the Internet, where there's no body language or other social cues, is hard! One thing I've personally noticed is that users are more receptive to polite, carefully worded comments, and I feel like the community has more to gain if those users come back a second and third time and put more effort into correcting their question-asking or answer-giving shortcomings, than if they were just left with nothing more than a link, a stern warning, and a bitter, angry feeling. When leaving a comment, say "hi" and use the person's name, if provided. Since @username doesn't work anymore, I find that this approach is much more personable and sets the tone for the rest of the comment. Welcome the person to the site if he or she is new. This helps disarm the situation. Use the first sentence to use what the person did or didn't do to describe what it is about StackExchange that's great, but without pointing out the behavior. Next, offer a suggestion for improvement. This is important, and I really think this strategy is really helpful for people who are not moderators, simply because a person who makes a suggestion to another person helps bring the other person up to his or her level, with both people on the same level playing field. In other words, suggestions imply choice, and suggestions imply respect and equality. Suggestions imply that you're giving this person helpful, friendly advice that can improve that person's experiences on the site. Lastly, if there's enough space, consider following up with another welcome message, see you around, good luck, or some other positive closure. This approach also implies that you don't expect nor intend to respond or follow up, which is really helpful, since there isn't much a regular user can do beyond that, other than flagging for moderator attention. Some of these points were inspired by Chris F and Jerry's responses, but also from the blog post titled, A Theory of Moderation. So, what other suggestions are there for empowering community moderation -- as in moderation by non-diamond community members -- through polite, respectful comments? Please don't add "thanks" as answers. Invest some time in the site and you will gain sufficient privileges to upvote answers you like, which is the Programmers Meta way of saying thank you. This is really a comment, not an answer. With a bit more rep, you will be able to post comments. For the moment I've added the comment for you, and I'm flagging this post for deletion. Please use the Post answer button only for actual answers. You should modify your original question to add additional information. If you have a NEW question, please ask it by clicking the Ask Question button. If you have sufficient reputation, you may upvote the question. Alternatively, "star" it as a favorite and you will be notified of any new answers. From this script. For more info, check out Stack Apps. Hi Person, welcome to Programmers! Unfortunately, our site is a Q&A site for conceptual software development questions, and not a place to simply get answers from programmers about any topic. I am going to vote to close your question for being off-topic, however feel free to check out our faq or browse the site to learn more about us. It begins with a friendly welcome, followed by "unfortunately" to show you see the users point of view and sympathize with them, clarifies the site topic, explains the close vote, shows them where they should start to use the site, and invites them to stay on the site. Welcome to Programmers! Please check out the [FAQ], as it seems like your question is off-topic here. Perhaps [SO] is a better place to find your answer? My goal with this comment is to remove any possible negative tone, and be as constructive as possible. It's also short and easy to remember. Of course, [SO] should be replaced with the proper site to suggest. On a per-case basis I contemplate saying why it is off-topic, or why it would be on topic for the suggested site. However, by not saying why, I think it encourages people to actually read the FAQ because they are either genuinely curious, or want to find evidence to refute my claim. I also like phrasing where I think the question should be as a question. This way my suggestion feels more like an offer, which is more accurate to my intentions, rather than a demand. It also leaves it open for debate. I don't know everything, so it's possible that there is a better place to suggest finding the answer, or that maybe someone from the place I suggested doesn't agree. As part of the question I specifically say "to find your answer". My hope is that it implies that the person should search the site first, instead of just blindly re-posting the question. Overall, for me at least, it is an acceptance on my part that the person is on a "journey" to find an answer, and that I am not just shutting them down, but instead offering advice. 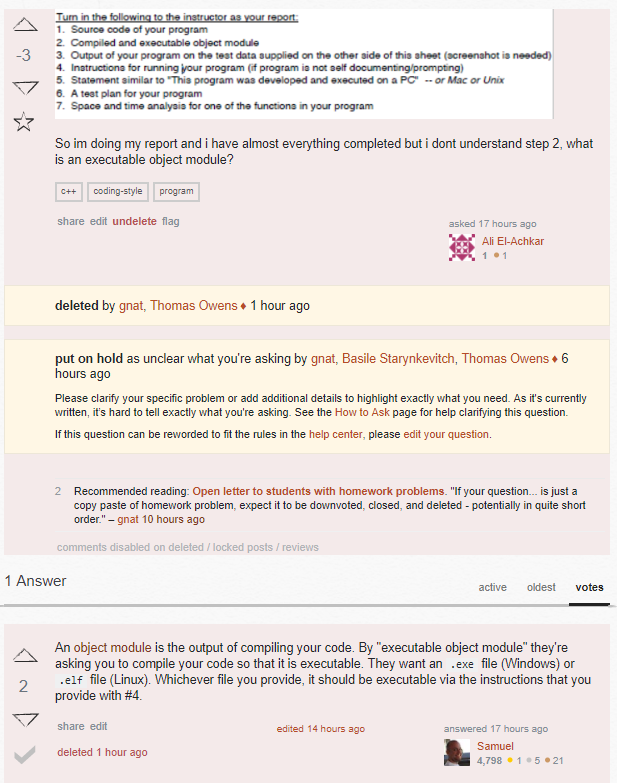 recommended reading: **[Open letter to students with homework problems](http://meta.programmers.stackexchange.com/q/6166/)** "...If your question on Programmers.SE is just a copy paste of homework problem, expect it to be downvoted, closed, and deleted - potentially in quite short order." Above is markdown allowing straight copy and paste into comments field. Above, again, can be copied and pasted straight into flag message. I am going to type part of the homework dump from the image in this question into Google search, find instructor who assigned it and ask them to help with this, are you OK with that? I am going to type part of the [homework dump](http://meta.programmers.stackexchange.com/q/6166/) from the image in this question into Google search, find instructor who assigned it and ask them to help with this, are you OK with that? Not the answer you're looking for? Browse other questions tagged discussion moderation comments etiquette . Migrating Crap to SO. Really, Programmers? Why does this homework dump deserve to stay on site (while prior was deleted)? Why was my question about the consequences of using Windows XP closed?